There are many trainers to choose from on the market that can offer the challenge you need. There are bikes on the market that provide wind resistance; as you go faster the fan in the back creates a stronger wind resistance. There are fixed resistance options, as well as fluid resistance. With various features to choose from, the perfect trainer to suit your needs is likely available on the market right now. If you are interested in training inside on your 29er or other mountain bike, then all you need is a good mtb indoor trainer and you will be all set. There are a lot of different models on the market, so finding a good quality option can be a bit of a challenge. So, let me help you out with that by sharing some of my favorite indoor mtb trainers for the money and letting you know why you might want to get one of these for yourself. Why Use An Indoor Mountain Bike Trainer? If you’re like most mountain bikers out there, you might be asking yourself if you really need one of these. And more specifically – But what does an indoor trainer have to offer me? The truth is that indoor mtb trainers offer a lot of benefits to riders like you and me. Below you’ll find some of the best reasons that I think you need to use one of these at home. The fact is that, unless you live in some form of a perfect weather paradise, there will be rainy, snowy, or otherwise horrible weather days. It is easy to skip your riding on those days because of the outdoor conditions. If you have the option of an indoor trainer, however, you will be able to get in a good ride from the comfort of your home. There will be virtually no excuse to skip out on days because the weather is always just right indoors. The high quality trainers on the market will provide you with a high intensity, sweat drenched, heart racing ride that you have become accustomed to. While riding an indoor stationary bike can seem like a dry, monotonous workout, it can also provide you with the clarity and focus you don’t typically get outdoors. When riding outside, you have to pay attention to pot holes, on coming traffic, and anything that can harm you when you are going full speed. It does not leave much room for mental focus on the activity at hand. By doing a few indoor bike rides, you will build up your endurance mentally for better workouts in the future. When you are cycling outdoors, you have little to no control over the environment and this can interrupt your workout. By committing a few workouts to your indoor trainer, you can perform specific, controlled workouts that will benefit your overall endurance and strength. If you are an outdoor rider, there is just about nothing in this world that is in the running to completely replace your outdoor bike. 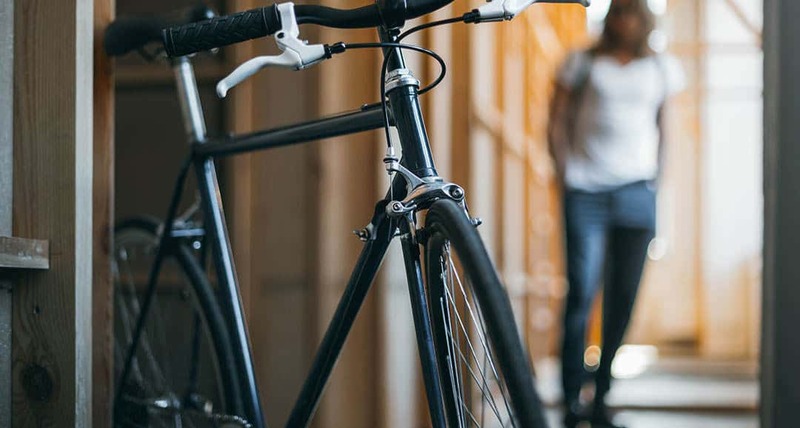 However, there are real benefits to incorporating indoor bike rides into your work out routine. To narrow down your choices when shopping, I suggest that you start right here with my top five picks. I have compared all the best indoor mtb trainers and narrowed it down to just these five outstanding models. No matter what your budget, one of these should meet your needs. So, read each of my mini reviews for these indoor trainers and see if it makes your shopping a little easier. 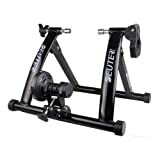 Though I think that this one is a little over-priced, it is still a great indoor trainer. And if you can manage to find it on sale or for a discount online, then it is worth buying for yourself. Like the others, this one folds for easy storage. But what I really like about it is how you can get different bike workouts on it. For instance, there is a “road” setting, a “mountain” setting and so on. In total, there are four different training options for you to choose from. Overall, this one is fairly quiet and smooth. It honestly works very well and you won’t be sorry if you buy this one. For me, it is strong contender with the Kinetic but I’d choose the Kinetic over this one just based on the price difference as quality is very similar between the two. It doesn’t get any better than this Kinetic mtb indoor trainer. 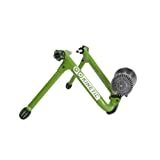 It is super easy to use, it is ultra durable and sturdy, and it is the highest quality indoor mountain bike trainer for the money. This thing is truly a beast. When you buy this, it comes 100% completely and totally assembled. All you have to do is take it out of the box and you can start using it immediately. That is awesome. It folds up for easy storage when not in use, which is great for small apartments or limited space at home. And best of all, this is the quietest indoor mtb trainer that I have ever seen. Seriously. 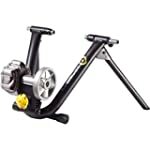 If your main objective is to buy a quiet mountain bike trainer, then this should be the only option for you because nothing beats it when it comes to noise level. All in, you get 9 different levels of resistance and they are all both smooth and quiet. You get a smoother ride and less tire wear on this model than the others listed on this page. And that is definitely something worth considering. You get 7 different resistance levels with this trainer. And though it is advertised as quiet, that is actually not true. In fact, you have to turn up the volume on the television when you use this one. That being said, this is still a good mtb trainer. It folds for easy storage and it is easy to set up for use. The trainer itself feels sturdy and like a durable piece of equipment that will last for some time. However, the resistance levels could work a little better to give you more of a workout on your bike. One of the best things about this one is the price. 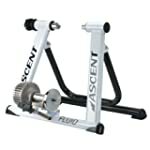 If you need a good mtb indoor trainer for under $100 – $300, then put this one on your list to consider. Otherwise, see if you can spend a little more for a better trainer. 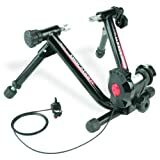 If you can’t afford the Kinetic mtb trainer listed up above, then this model is a good second choice. After the Kinetic, this is the quietest indoor mountain bike trainer that I have seen. It really is very quiet while in use. There are six different resistance settings with this one and they are all smooth and work well. The quality seems very good with it feeling durable and strong. Assembly is very easy to do on your own and you will be using it in about 15 minutes or less. And I really like the bar-mounted remote for the resistance level settings. Overall, I’d say that this trainer offers a great value for the money and it is almost as good as the Kinetic model reviewed up above. 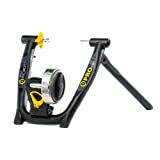 This trainer right here is consistently the best selling mtb trainer on the market when you look at the online stores. It is also one of the top rated models that you can buy. And all of this is for a good reason. This thing has an affordable, low price and features five resistance settings. It is a reasonably quiet mtb indoor trainer, which is important if you live in an apartment or don’t want to disturb the family. I love the small, compact design of this trainer. And it folds up for easy storage when not in use. The steel frame seems very sturdy and of decent quality. 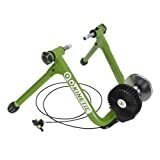 Overall, this is a good cheap mountain bike indoor trainer that isn’t too loud and serves its purpose. Assembly is easy and it seems of good enough quality for the money. Sure, it’s no Kinetic, but it’s got a relatively cheap price!